Hot on the heels of this mornings reveal of Ultron on the new cover for EW, the first real photos from The Avengers: Age of Ultron have popped up. 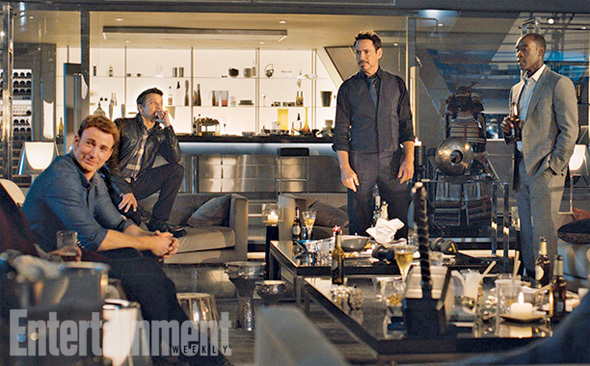 While they don't show more of the title villain, Captain America (Chris Evans) and Thor (Chris Hemsworth) look out of place in a normal house, Bruce Banner (Mark Ruffalo) and Tony Stark (Robert Downey Jr.) are doing science, Black Widow (Scarlett Johansson) and Hawkeye (Jeremy Renner) see some action in the woods and new heroes Quicksilver (Aaron Taylor-Johnson) and Scarlet Witch (Elizabeth Olsen) are in some kind of trouble. Even Don Cheadle pops up to hang out! We can't wait to see the first footage of the film at Comic-Con! Look below! It would be funny if Marvel didn't show any footage at all. It would be and let' be honest Marvel could do it because it wouldn't any negative effect. As much as I'd like to see some early footage, you know it's going to get poured over and analysed up the a-hole. This quicksilver looks like he just came out of retirement compared to DoFP. Loved the first version, so I am completely biased and hopefully will be impressed with this version. Quicksilver looks like a loser. They said the same stuff about DOFP's Quicksilver too. I liked how That QS looked. But this pic of this QS just looks lost and confused. 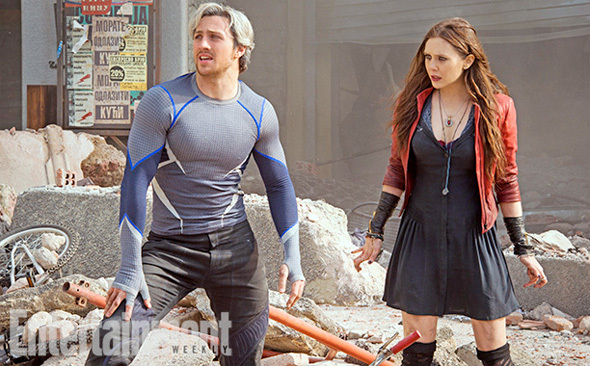 Quicksilver looks stupid. Hawkeye needs a mask. (I know I'm probably alone on this one, but) I can't stand Scarlett Johanssen. The DOFP Quicksilver looked A LOT worse than this Quicksilver, but the DFOP one turned out to be pretty great. No...I kinda agree with you on some sort of mask for hawkeye, but knowing they'd make his mask as current as possible, he'd probably look like Zorro. But I do think, at least in battle, Thor should wear his helmet! I get it....everyone loves to see is godly, golden hair blowing in the wind, but we've seen that in Thor 1, 2, and Avengers. Change it up and give him back his helmet like he wears in the comics/cartoons! LOL agree about Scarlett Johanssen. Wish they had selected another actress. Plenty of Russian beautiful actresses with the build that could have played the part. I agree. 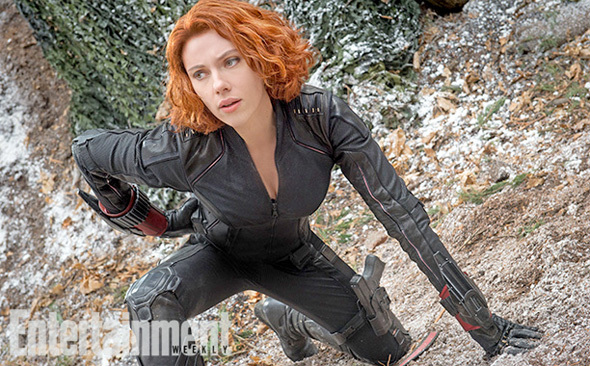 As much as they try to make her character cool, there is just something Scarlett that I dislike. Why is it...with all of these sequels (both Avengers and the standalones)...everyone has to have a new hairstyle? It's been what, 2 maybe 3 years between A1 and A2, and yet I've kept the same hairstyle for over 5 years. That seems like an odd complaint, just because some people might not ever change their hairstyle, doesn't mean others don't. Also, the only hairstyle that stood out to me as being particularly different in a stand-out way is Black Widow's...and women change their hair much more often than men. Rogers, Stark, Banner, and Thor all seem to have more or less the same looking hair...it at least seems about the same length and have the same general look. So even if the hairstyle is different, it isn't hugely different. I've kept the same basic hairstyle for the last 8 or 9 years, but I almost always have subtle changes from time to time, getting it cut at slightly different lengths, letting it grow out a little longer than usual before getting it cut again, etc etc. I think it being different is a bit more realistic than it looking EXACTLY the same. It's not a complaint, it's just something I've tended to notice in all the films that seem to have sequels. I get more of a kick out of it than calling it a complaint. Next time I'll right "LOL" after the comment so I don't receive an essay response saying I'm wrong. My apologies. It's hard to identify tone on the internet, and I clearly took your comment more seriously than you meant it. My bad. I'm just used to unnecessary hate being abound when it comes to big/popular/anticipated movies...so sometimes I get a bit of a knee-jerk reaction. Again, my mistake. 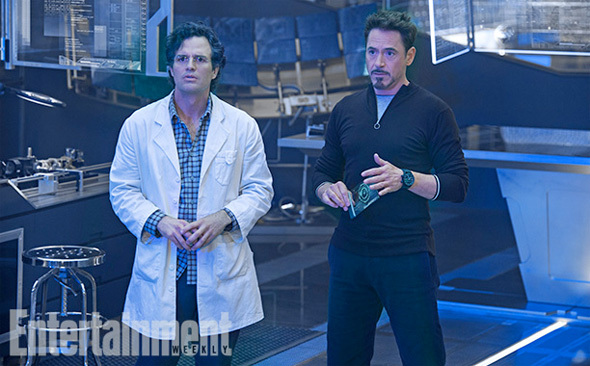 Science bros! Here's to Banner/Hulk having a larger/more central role in this film. Agree 100%. While I love Ruffalo's take on Hulk/Banner, I *don't* want to see a Hulk-centric movie. Science Bros though? With the Hulkbuster coming out to play? 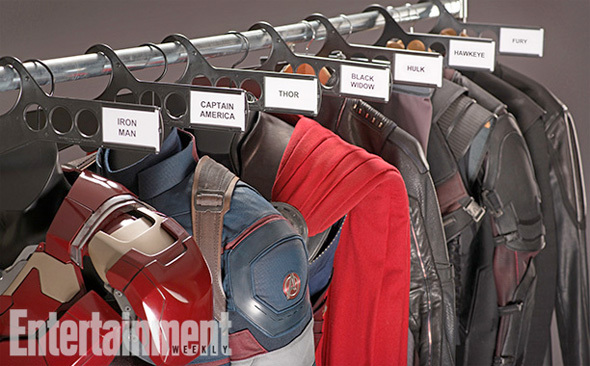 (Although apparently the suit will appear in Avengers 2, sadly)... that would be great. RDJ & Ruffalo have great buddy chemistry on screen, and appear to be good pals off-screen as well. Mjölnir sitting on the coffee table with a bunch of food and beer. That was the first thing I noticed as well. Time for the team to hit some BBQ and then play Black Ops on the XBOX! Shouldn't the weight of that hammer break the table? 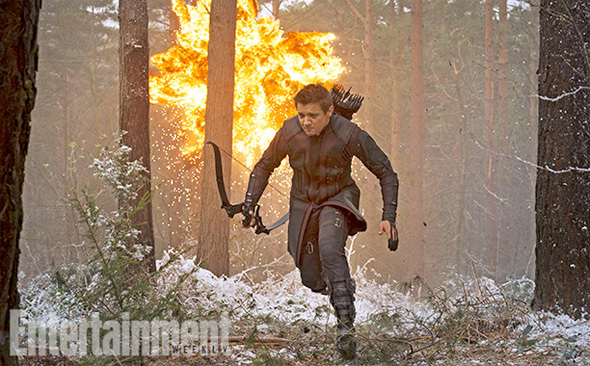 SWEET....they used a still of Renner in Hansel & Gretel: Witch Hunters.....Cool!!! Don Cheadle! Yes! I hope there's lots of War Machine in this one. Dunno how likely that is, though. Maybe he's just naturally filled out his frame as he's gotten older? I think he just turned 24...there is the whole 'you're an adult at 18' stuff, but many people don't really seem to completely fill out their frame until their early 20s. Possibly. Looks like he de-bulked/re-distributed what he had in "Godzilla". 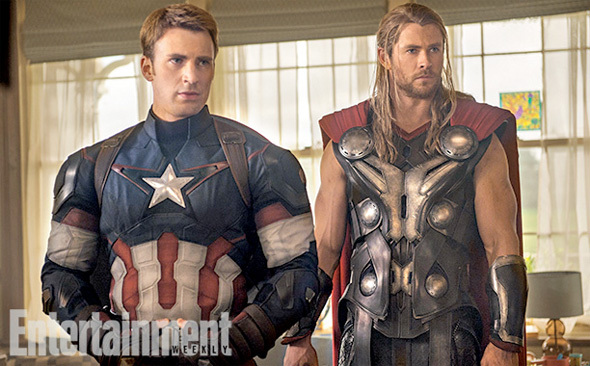 There he looked almost like he was all muscle w/ no neck; looks much more natural in Avengers. I'm not looking forward to the new Avatars and Supermans but I can't deny that I'm super excited for this. Thor 2 and Capt A 2 were very disappointing for me but I have faith in Joss. Are you an MCU fan? Cap2 gets a very solid 8,2 at IMDB. Is Falcon going to be present in this? I hope so. He was badass in Cap 2.